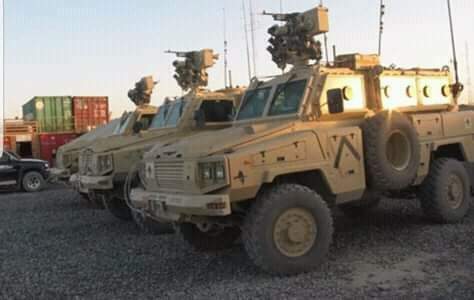 Some of the armoured vehicles seized by customs at Khoms port (Photo: Social media). 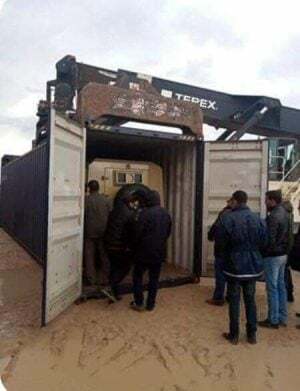 The Tripoli Protection Force (TPF), a coaliton of Tripoli’s main militias, has called on Libya’s Attorney General to immediately and urgently investigate the shipment of armoured vehicles that was seized by customs officers at the port of Khoms. There were unconfirmed reports that guns were fired at the port as there was an attempt to forcibly remove the armoured vehicles form the port. 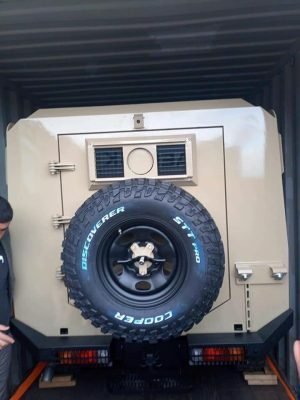 It will be recalled that the Serraj Ministry of Interior announced on Thursday that the seized shipment of armoured vehicles arriving on the Maltese flagged ship Marco was confiscated by its forces upon the instruction of the Attorney General’s Office – until the Attorney General’s Office concludes its investigation into the case. The shipment had allegedly arrived from Turkey, but reportedly had no official documentation. This may have been convenient as there is still a UN ban on the export of weapons to Libya. An armoured vehicle in a container seized by customs at Khoms port last week (Photo: Social media). The TPF also called for an investigation into the shipments of various weapons and ammunition that had previously arrived at Khoms port last December. That shipment had also allegedly arrived from Turkey. The TPF called on the AG to reveal all the facts to the Libyan people, revealing those involved in these shipments and the official Letters of Credit used to import them. One of the armoured vehicles seized by customs at Khoms port last week (Photo: Social media). The TPF also called on the Attorney General to investigate the recent south Tripoli militia fighting, and to prosecute those responsible for it using ministerial decisions to deliberately spread sedition. On another note, the TPF also called for an investigation into the south Tripoli militia fighting financiers and supporters, and the saboteurs of the successful peace efforts. The TPF reasserted that it now only recognizes the legitimacy of the Serraj-led Presidential Council when it acts in unison with its nine full members, as prescribed by the 2015 Skhirat Libyan Political Agreement (LPA). This is a very convenient fig leaf for the TPF as it knows fully well that nine members of the Presidency Council are never present and never agree on Libya’s polarized politics. The TPF also demanded that UNSMIL fully implement the LPA, and not use it selectively using the LPA’s authority for suspicious party and regional agendas. Again, the TPF is playing politics here as it knows that UNSMIL and the Serraj-led Presidency Council and Government of National Accord are unable to fully implement the LPA. One of the main reasons why the LPA cannot be implemented is the continued existence of militias – including the TPF. The continued existence of militias at the expense of a regular, accountable and legitimate police and army directly negates the recreation of a strong state. The TPF also said, with much irony and political surrealism, that it was looking forward to the “urgent” forthcoming presidential and parliamentary elections, to renew true legitimacy derived from the Libyan ballot box. It undertook to protect the elections and to cooperate fully with the High National Electoral Commission (HNEC) to make the elections a success. The TPF makes these declarations knowing full well that any new fully democratic, legitimate, independent and strong government would do away with self-fulfilling militias in favour of a regular accountable army and police force. It also said that it would support any efforts in the fight against crime and terrorism.